Random Microseed Matrix Screening Introduction. Our PDF Instructions card for making the Seed Stock. Instructions and references for preparing the Seed Stock. A new technique has been sweeping through the crystallization labs of Europe, but it seems to be less well-known in the USA. For years, crystallizers have known that they can often initiate crystallization in samples by adding seed crystals to the mixture. This often works dramatically for proteins, and scientists have used it routinely for optimization - by seeding into conditions identical or similar to conditions that gave hits before. What is less well-known is that the same approach can be used in the screening step of crystallization. Simply adding say 100 nl of crushed crystals (suspended in the reservoir solution that gave the hit) can increase dramatically both the number and quality of crystals obtained. This has several advantages: firstly, screening experiments are generally much easier to automate than optimization experiments. Secondly, it can be done without significant planning – simply crush the crystals in a well, transfer to a tube containing the appropriate solution, vortex to break up the crystals even more (the Hampton "Seed Bead" helps here) and add to a normal screen. Thirdly, the seed stocks freeze really well – so you can almost guarantee to reproduce crystals of any protein that you have ever crystallized – even years later. For Douglas Instruments, the story began in 2006 when Allan D’Arcy (Novartis, Basel) asked us to write a "matrix-seeding script". This simply involved picking up seed stock from the stage of the Oryx robot in exactly the same way as protein, and adding it to all the wells of a screening experiment alongside the protein. Allan published the spectacular results of the technique in 2007 (Acta Cryst. D63, 550-554). For five target proteins that he worked with, it increased the number of hits by a factor of 7. Allan dubbed the method "MMS" (matrix microseed screening), following Ireton and Stoddard (although Allan’s approach differed from theirs in several important respects). Labs that use MMS routinely tell me that it gives an improvement in 75 to 80% of cases. For example, one industrial group uses the method whenever they get hits (good or bad), and they have had good results with cross-seeding – using crystals of a protein to seed similar proteins or complexes. Cross-seeding often works when there is some homology, so try crystals ofdifferent mutants and with different ligands (but don’t expect lysozme crystals to help with your new target protein – the structures must be related!). It may not be completely obvious why this method works so well. 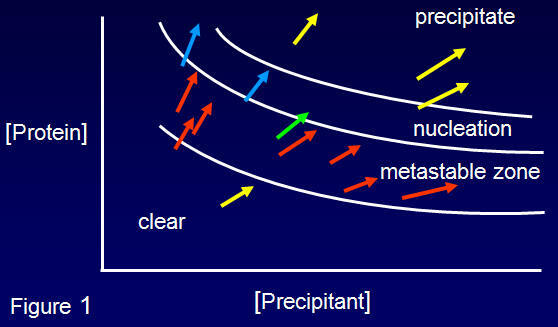 Remember that the phase diagram of a protein often includes a large area called the "metastable zone" (see Figure1). If you put crystals into the metastable zone they will grow. However, nothing happens if you set up experiments in this zone but fail to add crystals. Generally speaking, you will get the best crystals from experiments that start in, or at least move through, the metastable zone. You can imagine a screening experiment as a set of points landing randomly on a phase diagram (shown as arrows above because I’m assuming a vapor-diffusion setup). With normal screening experiments, you will only see hits that land in the nucleation zone (blue and green arrows), whereas if you set up MMS microseeding experiments, you will also pick up all the potential hits that land in the metastable zone (red arrows). There are a few pitfalls to avoid. The seed stock may not be stable at room temperature – most labs keep it on ice and freeze it as soon as possible. Also, the seed stock must be very finely crushed to be compatible with some robots (not a problem for robots such as Oryx that use contact dispensing). However, we believe that MMS microseeding should be part of your routine crystallization scheme – even if you set up experiments by hand! and http://www.douglas.co.uk/MMS_proc.htm for our suggested method of preparing seed stock.